Today was Day #1 of Chocolate and Music/Audio Theme Week. The list of items that make sounds and can also be added to chocolate is not infinitely long. One such item: Pop Rocks, or popping candy. Popping Candy may not be audible to an outside observer, but it can make a racket inside your head. Today's Crackle Crunch milk chocolate bar from Hammond's Candies (Denver, CO), was packed with tiny raspberry-flavored explosives. 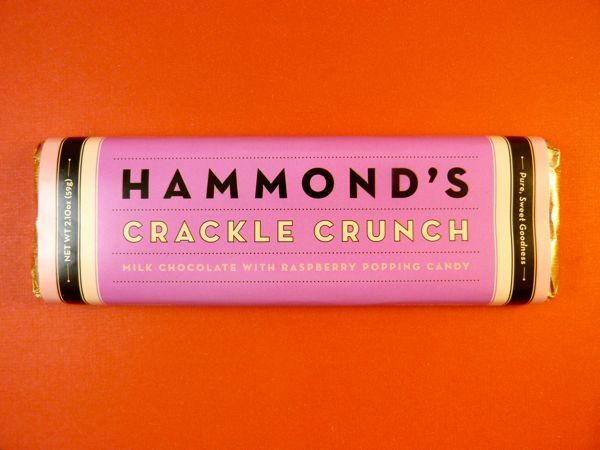 My only quibble: the tiny fizzy riot from the raspberry popping candy overwhelmed the milk chocolate and tasted a bit artificial.